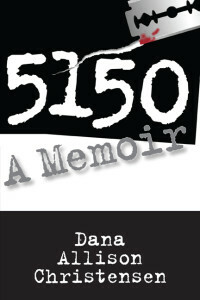 5150: A Memoir is no ordinary collection. It is a mixture of poetry and prose that explores her own personal journeys inside and outside of the psych ward. Dealing with issues such as sexuality, self-mutilation, eating disorders, substance abuse, and mental health, her book addresses a lot of issues that are seldom talked about (but need to be). She is currently on her way to recovery, and she hopes that by sharing her story with the world, she can help others in difficult times find the light and confidence within themselves to succeed in this difficult and fast paced world that we live in. The term 5150 refers to the section of the California Penal Code which deals with subjects who are, or may be, a danger to themselves because of mental disturbance. It allows law enforcement to hold a person for 72 hours for observation , to determine if they require a further, longer stay in the hospital (5250). This entry was posted in 2013, Book, Dana Christensen, Merchandise and tagged cutting, first collection, poetry, rehab, san diego on July 28, 2013 by bookdog.